The Formula 1 finale in Abu Dhabi epitomised much of the 2018 season. There was some high drama, particularly at the start, some moments of real excitement in the middle, building up to an exciting finale, which ultimately fizzled to nothing with a few laps to go as Sebastian Vettel couldn’t challenge Lewis Hamilton for the win. It’s been a great season of on-track action on the whole, and my three star drivers of the season were on great form in Abu Dhabi as well. Firstly, of course, the world champion. 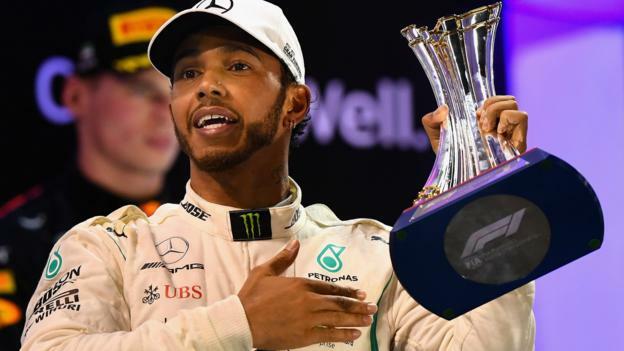 What a season Lewis Hamilton has had, and what a way to wrap it up in Abu Dhabi. Before this year, Hamilton had never won any remaining race in a season after clinching the title. This time he took pole and won both of the remaining races to end what turned into a dominant year in emphatic style. His victory on Sunday was one of the more understated. Having taken pole by only 0.15 seconds ahead of team-mate Valtteri Bottas on Saturday, he pitted early in the race, which seemed a bold call by Mercedes. But while Bottas struggled after his own stop, and dropped down the order, Hamilton was in complete control. He beat his team-mate, who had started next to him on the grid, by almost 50 seconds. The comparison between Hamilton and Bottas is stark this year. Over the first half it was much closer, but you felt Hamilton had the edge. The second half was a demolition. After the halfway point at Silverstone, Hamilton won eight of the remaining 11 races. Bottas scored just four podiums in that time and didn’t get a victory all season, finishing 161 points behind his team-mate. Bottas is a good driver, and it highlights just how good Hamilton has been this year. I can’t think of a more impressive performance by any driver over the course of an entire season than this one from Hamilton. My second driver of the year is Max Verstappen. He’s undeniably super-talented. He’s unbelievably quick but prone to being hot-headed and making mistakes. But over the course of this season he has developed into an almost complete driver. Verstappen came in for a lot of stick after Monaco, where he crashed in practice and therefore had to start from the back. It was the latest in a series of errors over the early races. He had the pace but kept making mistakes – he had incidents in all of the first six race weekends. But boy has he turned it around. Podiums in all of the last five races – including a win in Mexico, a should-have-been win in Brazil and a drive to second from 18th on the grid in Austin – show his potential for next year. Finishing fourth in the championship, only two points behind Kimi Raikkonen, is an extraordinary achievement, considering his difficult start to the season and the lack of competitiveness from his Red Bull team, particularly in the middle of the season. Verstappen drove another strong race on Sunday, recovering from a poor start that left him on the edge of the top 10 and nursing his car through engine overheating issues early on. He showed his extreme aggression in the car with moves on Force India’s Esteban Ocon early in the race and then Bottas late on, having minor contact with both. It shows there’s still a risk element to his driving, which if someone is fighting for a title isn’t ideal, but at least right now Verstappen is getting it right more often than not, when earlier on in the year it was costing him dearly. My third driver of the year is the man moving to Ferrari to partner Sebastian Vettel in 2019. Charles Leclerc had a super weekend in Abu Dhabi, qualifying comfortably in the top 10 before rising up to fourth place in his Sauber early on, legitimately passing Daniel Ricciardo’s Red Bull. Sauber pitted him too early, which mired him in traffic for a large part of the race, but he showed impressive race-craft to match his obvious pace. Leclerc had big pressure coming into the season after a standout performance last year in Formula 2 and starting in a struggling team as a Ferrari junior. But for a rookie he has been incredibly consistent, making very few mistakes, after an admittedly shaky first couple of races. Sauber are the most improved team this year, and I’m sure that a significant part of that is down to Leclerc extracting the last bit of pace from the car and giving the team fresh motivation. These three drivers are hopefully going to be big rivals next year, with each in one of the three top teams. The three-car battles for wins at the end of the season have added an extra dimension to each race and made them more thrilling as a result. Verstappen’s chances next year hinge very much on Honda hitting the ground running in their new partnership with Red Bull, who switch from a 12-year partnership with Renault. Red Bull have a superb chassis. The fact they won races this year, despite a significant power deficit compared to Mercedes and Ferrari, underlines that. If Honda can prove to be an upgrade from Renault, as Red Bull hope, they will surely be a threat, particularly if Verstappen can keep his form going from the end of this season. Leclerc can be a big threat in the Ferrari next year. It’s one of the things I’m most excited about. He will come in with an assumed position as number two to Vettel, but it’s very possible he could out-perform the German, win races and even make his own challenge for the title. I’m sure Vettel will be wary of his arrival into the team, particularly after his experience with Daniel Ricciardo at Red Bull in 2014, where the young driver upset the establishment. As for Hamilton, he’s driving at his best, has a team who are proven winners behind him and seems to be enjoying his racing more than ever. He will be so tough to stop in 2019, but the two other stars of 2018 will be giving it their all to do exactly that. A final word for another star of 2018, and Formula 1 in general. Fernando Alonso has been superb this season in a McLaren that has been woeful. Pipped to the top 10 in the drivers’ championship on the final day, Alonso still managed to almost single-handedly secure sixth place for the team in the constructors’ championship, an incredible achievement considering McLaren have often had either the slowest or second slowest car this year. To finish the season with a record of 21-0 against team-mate Stoffel Vandoorne in qualifying shows Alonso is still driving at his best as well. Just as with Bottas at Mercedes, Vandoorne is no slouch, but he’s been made to look second-rate this year, to the point where he is out of F1 for 2019. Alonso will be a big miss for F1 as a whole. He’s one of the all-time greats and, on a personal level, it was a pleasure racing him during 2016 and 2017. Alonso has been plagued by off-track politics and poor decisions in F1. And when it comes to karma, he is certainly due some payback as he attempts to complete the triple crown in 2019 by adding victory at the Indianapolis 500 to his F1 and Le Mans titles.